Okay, so I’m going to start this post with two statements. 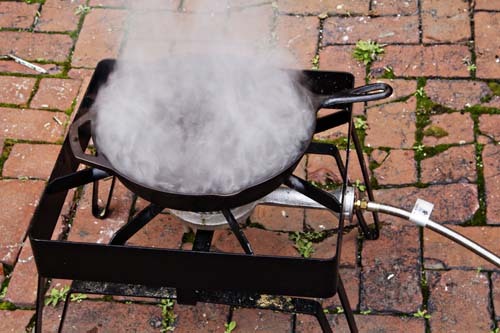 The first is aimed both at my parents and my landlord- I promise that when we did this portion of the restoration we had a fire extinguisher on hand and that the pan was not close to anything that could catch on fire. The second is aimed at my father and everyone who knows better than me- I know I used too much oil. I mean, I didn’t know that at the time, but have since realized that I did not need to use that much oil. Thankfully Dan is an Eagle Scout so all the necessary precautions were taken. Now for the light-on-fire installment of our series. 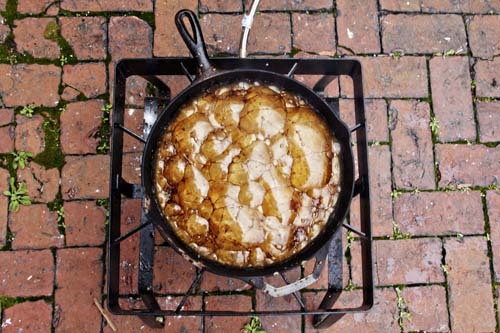 As you’ll recall from part 3, the next step was to coat it with oil and “burn the bejesus” out of the pan. So on Saturday we hauled out our large burner, threw some oil in the pan, and sat around until it caught on fire (extinguisher in hand). The Capt’n’s advice was to only put the fire out “when it got a little crazy,” so I was expecting for this to get interesting. We added a 1/4″ of oil to the pan, which I take it is too much. 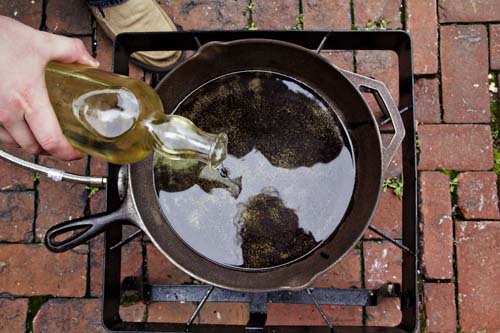 The Lodge website suggested “a thin layer” and my dad (later) told me to put oil in the pan, spread it around, and then dump the excess oil out. Somewhere in the middle is probably best. 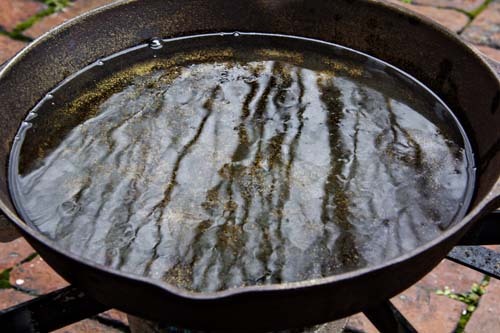 From what I gather after reading about the process is that by bringing oil past its burning point in an iron pan you release free radicals that help to restore the iron. Something about polymerization. Remind me to ask my chemist father-in-law about it the next time we see him. I don’t totally know why it works, but I do know people have been doing it for centuries, and that’s good enough for me. The internet is also full of arguments about what kind of oil to use, vegetable oil versus lard, etc. I’m not going to get into that because I really can’t speak to what is best. I used canola oil and it worked just fine. As the oil heated up Dan’s comfort level shifted from “this is really cool” to “this is making me nervous” quickly. 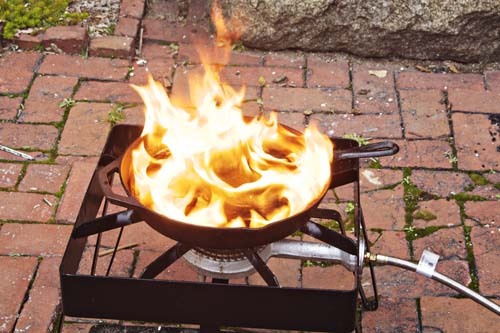 As soon as it started smoking a lot we cut the heat, and at that exact moment it burst into flames. Following my dad’s advice I used baking soda to extinguish the flames, which worked like a charm. The flames when out and then the oil-carbon-rust-baking soda combination formed these really gross/awesome bubbles. Once it had cooled down I brought it inside and scooped out this gunk that was completely fascinating and disgusting. After I got all the excess oil residue out I used a combination of steel wool and hot water to really scrub at the pan until it was rubbing clean and totally rinsed out. This took approximately fifteen minutes. After drying it off it looked like a brand new pan, it was amazing. Even though it’s looking worlds better than it was a few weeks ago, I’m going to do one more round of sanding to really make sure I get the last of the carbon and rust out. Then there will be two more steps- a gentle oven seasoning and its bacon christening. I am so impressed by how (relatively) easy this whole process has been. Time consuming, yes, but since I’ve been working slowly it’s been so much fun. I can’t wait to pick up more cast iron to work on! Incredible!!! Such awesome pictures. I feel like I was there. 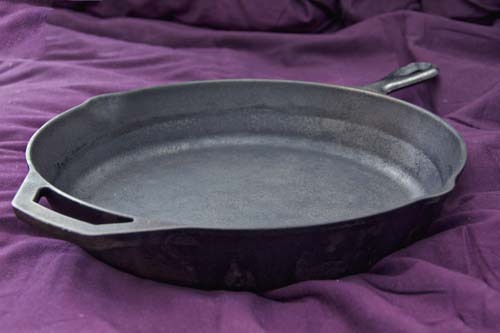 I’m going to have to keep my eye out for old cast iron pans and pots at flea markets and garage sales now. We only have one big skillet and a griddle, and I love them both. More would be wonderful, and I’d love to try your restoration method, fire and all! Wow! Pretty incredible pics! 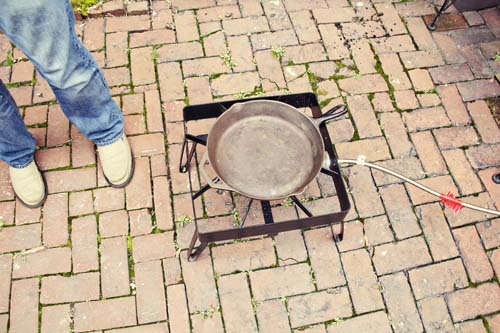 I had considered cleaning up an old pan this way and chickened out in the end. So I ordered an old Griswold from eBay instead. The guy I got it from did all the cleanup for me so it was easy peasy, but expensive. I adore this pan!